Hi, Everyone! Happy Monday to all! If you’re new to here, welcome! 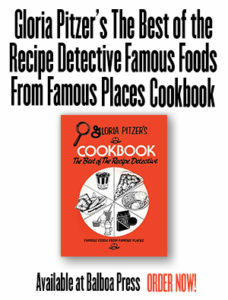 I’m Laura Emerich – one of 5 who called Gloria Pitzer, the ORIGINAL “Secret Recipe Detective”, “Mom”. I started this blog series in September (2018) to carry on Mom’s legacy of her Secret Recipes “empire”, as it was very special to me too; especially over the last few years of her life while I collaborated with her in re-writing her favorite cookbook, to be re-published by Balboa Press, and inspire a new generation! 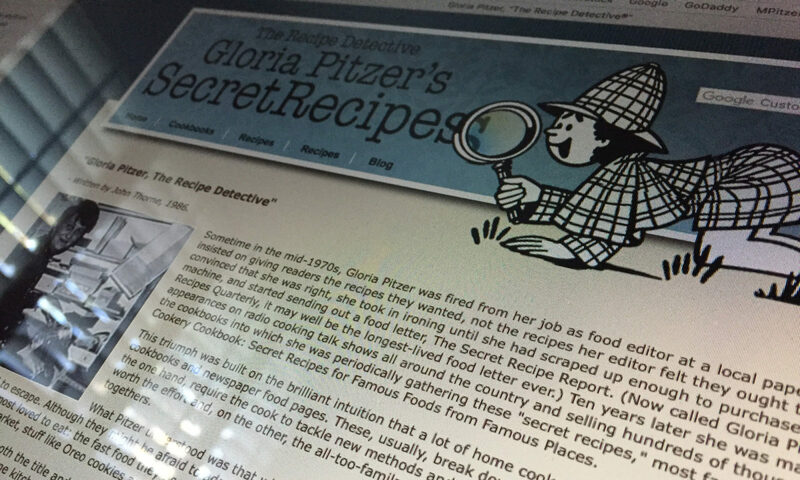 BEHIND THE SCENES – “Private Investigator of Secret Recipes” or “The Recipe Detective” are the names that my friends in radio and newspapers have given to me, and I enjoy living up to that assignment! I enjoy working with these recipe secrets, but most of all, I enjoy writing about them. I’ve been writing all my life… Going way-back to when I was in grade school. I was always writing a book, or a poem or a short story. It was a way of life from my earliest memories – a way over which I seem to have no personal control! I had to write… Preferably about what I knew best at the time. Little did I know that what I would come to know best would be cooking! The one year that I spent at Michigan State (when it was still a college, mind you – you figure that out!) … Was one year in which I learned 2 important things – I could not pass my Creative Writing course and I was “kicked out” of Home Economics! My Creative Writing instructor told me that I typed a neat looking paper and probably should be a secretary, for I would never make it as a writer. My Home Economics instructor advised me to spend the rest of my life having my meals delivered, for I was always finding fault with the way so many cookbooks were written. I took a position with the J. Walter Thompson Advertising company in Detroit, working as a secretary to the copywriters. I met my husband, Paul, there when he returned from a 4-year tour of service with the Air Force. We started dating and one year later we were married. That was 1956. Bill was born over a year later, and then Mike came 20 months after that, and Debbie came along 20 months after that. I lost 3 babies in the next 3 years, but Laura was born in 1964 and Cheryl came 20 months after that. During those years, Paul was working for a sign company in Mt. Clemens, Michigan – where, in the 20 years he spent with them, he did everything from drafting to purchasing agent to account rep! I kept up with my writing, always working for one of the suburban papers and constantly free-lancing to magazines. When Redbook sent me $500 for my “Young Mother’s Story” submission in February 1963, called “We’ll Never Live with In-Laws Again”, I put part of the money into a typewriter, as I had always had to borrow one before that. I wanted a typewriter more than Reagan wanted to be president! I put a lot of miles on that $39.95 machine – I designed a column for weekly newspapers and mailed out samples to over 300 newspapers. Within a year, I had acquired 60 regular papers for my “No Laughing Matter” column and another column I called “Minding the Hearth”. 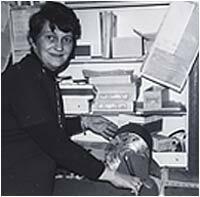 Columbia Features in New York offered me a contract, and, for a year, I allowed them to syndicate the column in competition with a new humorist, Erma Bombeck! (Right church, wrong pew for me!) When a big city paper carried Erma’s column, Columbia placed mine in their competing paper. I split with Columbia on a 60/40 basis (I took 40) and finally, by mutual-agreement, we broke the contract. I was on my own. 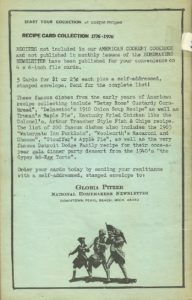 HOW SECRET RECIPES BEGAN – When Columbia Features and I parted company, they had acquired only 2 additional papers from me and lost several more. Within 6 months, I had regained all my original papers and was syndicating the column from our dining room table, where we then lived in what my friend, Bob Allison, called “beautiful downtown Pearl Beach” – a town so small that I told people City Hall was over a Dairy Queen, our McDonald’s had only one arch and, if we had a Howard Johnson’s, it would’ve had only 3 flavors! We had a 9-year old station wagon at that time. It burned oil and barely got Paul to work and back without something breaking down! I rode a bike to and from the Pearl Beach post office every day where I mailed out my columns and, then, looked for responses to ads I had placed in the Tower Press and Grit magazines for recipes on 4×6” cards that enabled you to imitate famous dishes at home. BOB ALLISON’s “ASK YOUR NEIGHBOR” – I was a regular participant on Bob Allison’s “Ask Your Neighbor” radio show that aired 5 days a week for 2 hours in the morning. I used Bob’s program for asking for food information that I needed for my weekly columns. Bob’s audience was very helpful in supplying me with answers. To reciprocate, I would reply to some of the requests made by his audience when they called into Bob’s show. It was a unique format in that one could not simply call in a recipe or information simply because they wanted to share it with others. The information or the recipe had to, first, be requested by a previous caller. Many of my first “Secret Recipes” were developed because of requests made specifically by Bob’s callers for such dishes as The Colonel’s secret spices, Arthur Treacher’s fish batter, Sander’s hot fudge, Win Schuler’s bar cheese and so on. At the suggestion of one of Bob’s callers that I should put all my column recipes into a book, I wrote my 1st edition called “The Better Cooker’s Cookbook”. In less than a month, I had sold 1000 copies. I wasn’t satisfied with the book, so I didn’t reprint it – but, decided that it might work out better if I could do those recipes monthly…I put together my 1st issue of what came to be my “Secret Recipe Report”, a newsletter that, for 106 consecutive monthly issues, brought me in contact with the many so-called secrets of the commercial food and restaurant industry. I probably wouldn’t have done the monthly, except for a falling-out I had with the editor of a small-town paper for which I was writing a food column. I had published some of my 1st attempts at duplicating famous dishes in that column and the response was beautiful, until I offended one of the papers biggest advertisers with a rendition of their cheesecake… “The kind that nobody doesn’t like.” The editor told me I would have to go back to standard recipes like macaroni and cheese, meatloaf or chocolate cake – or I could pick up my check. I told him to MAIL it to me. That’s when I decided it was time to launch my own paper. That afternoon, I put out my charter issue, sending samples of it to those whose names and addresses I had on file from having written to me at the paper. That was the beginning of “Secret Recipes”! I’ve recently started putting together a “Time Line”, of sorts, regarding all the different publications that Mom has written, illustrated and self-published over the past 4½ decades (1973-2018). There’s a few books that I don’t have, myself, so, I have to search the Amazon and Ebay websites for some of her old, out-of-print books. Soon, you’ll see updates to this website regarding the 2 “Cookbooks” tabs. I’m also still working on uploading more recipes to the “Recipes” tab as well. Also, stay tuned, next week, for part 2 of this series about Mom’s own story. In the mean time, as I do each week, I will end this blog with one of Mom’s make-alike recipes that appeared on one of her “Free Recipes/Information” sheets. 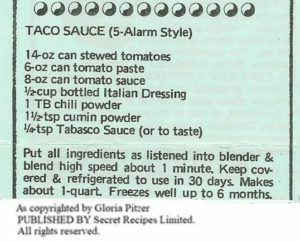 In keeping with the Super Bowl theme, whether you’re hosting a party or taking a dish-to-pass for someone else’s party, this is a picture of her easy and awesome, make-alike version of 5-Alarm-Style Taco Sauce (1985) to go with your favorite tortilla chips – asking only for proper credit if you care to share it. Previous PostPrevious Mondays & Memories of My Mom – Inspirations are Everywhere!